Because my work is all about marketing, I tend to view all corporate acts through the lens of marketing. Because I consider marketing to encompass every activity in the process of selling, it seems quite right to view corporate activity in this way. Having made my excuses, I would now like to discuss packaging. I was recently pleased to see the above packaging in supermarkets. The product doesn’t really matter for now; the important thing is that the packaging (allegedly) uses 75% less plastic than it used to. By swapping their hard plastic bottles for a thinner plastic bag, this company have instantly reduced their material use by 75%. What I can’t fathom is why everyone isn’t doing this. In a world where companies invest fortunes in carbon credits, or rescuing koalas from extinction, or internal recycling schemes, or glossy PR campaigns – why don’t they just do real things like being less wasteful? Does quality waste, destroy and fritter? Now, I understand the importance of brand, and the perception of quality. But I think modern times call for a redefinition of quality. Quality is not wasting the last few drips of oil on pretty packaging. That is idiocy. Quality is responsibility, and understanding the impact of your actions. Quality equates with intelligence, with doing the right thing, with social responsibility. Of course, many people recycle, so some may argue that marketers should be allowed to waste whatever materials they choose. But of course, not everyone recycles. Also, the process of recycling uses additional resources, so it’s much better to reduce consumption of materials in the first place. Big slow corporations – when will they catch up? I’m continually suprised by the lack of ingenuity and innovation displayed by major corporations. Why are they so reluctant to reduce, reuse and recycle? Has a focus group declared that they prefer wasteful packaging? 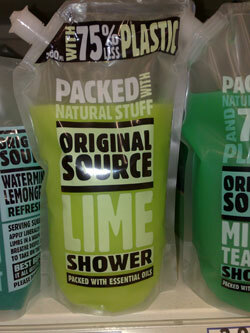 Incidentally, the company behind the intelligent, high-quality, environmentally-friendly packaging is Original Source.